There comes a time in every artists life when there is an overwhelming desires to paint the same image twice…though my style has not changed in the last few years, my skill (thankfully) has. I first painted ‘Summer Storm’ nearly two years ago. It was the first canvas I painted in my new studio and I have always loved it. But I really, really felt the need to try it again…so I did. I tweaked the composition, chose a smaller canvas , made the main figure bigger than in my last attempt and basically made an overall better painting, both compositionally and technically…I think! I muted the colours, changed the clouds and allowed the pop of red to really be the feature. 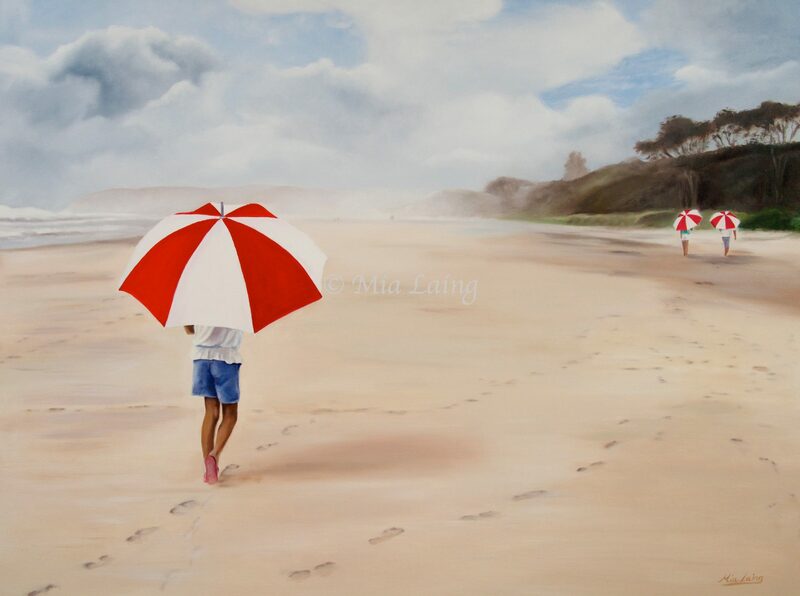 I think repainting favourite images is an amazing way of seeing how your artistic journey is progressing. It can be extremely tedious to paint the same image twice, so it has to be one that you are very intrigued or attached to…which for me was ‘Summer Storm’. 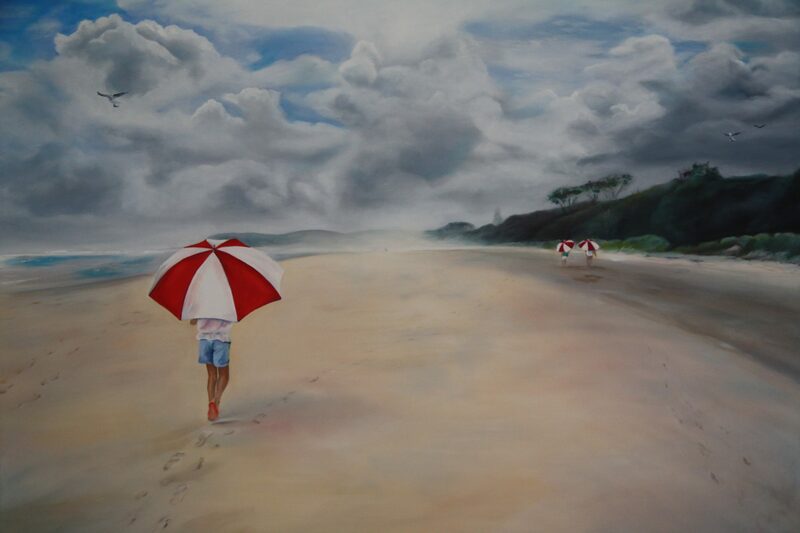 I took the reference photo on holiday in Byron Bay in 2010. 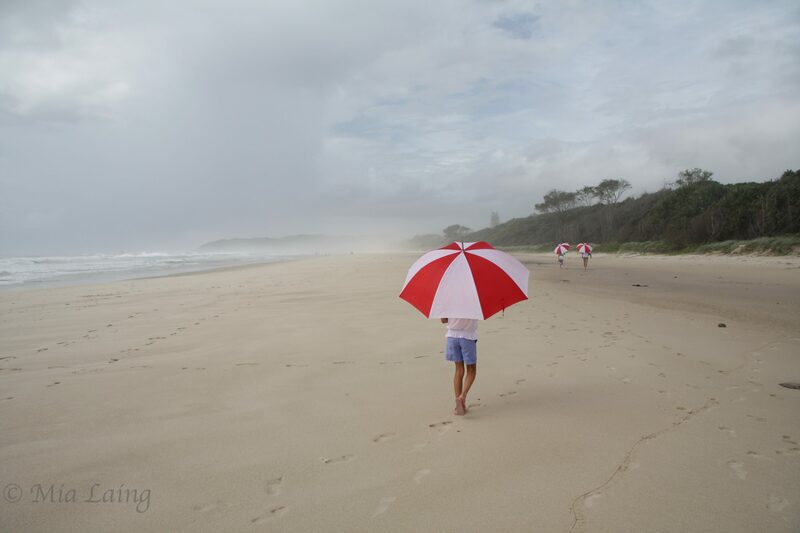 It was late January and NSW was experiencing an extreme wet season and summer storms – as they often do, but for us West Australians who barely get a sprinkle of rain over our whole summer, the torrential rain and somber, heavy skies were truely amazing! We were staying at the ‘Byron on Byron’….the most wonderful boutique hotel, for a conference that Dude was involved in. Thank you! Stunning…just stunning. I will never look at red and white stripey umbrellas without happy thoughts of that wonderful holiday ever again. …after all “painting is just another way of keeping a diary”. Mr Picasso…I love your words!